I really liked the premise of this mystery novel. “Slow Horses” are British Intelligence Agents who screw up on a case, but stayed employed. They are shipped off to a building called “Slough House.” Of course, in this novel, they collectively do something right, redeeming themselves at least in part. Unfortunately, IMHO, Herron simply does not deliver on this premise. We do not enter the story of the book until page 94. Up to that time, he gives us vignette after vignette of every Slow Horse currently housed at Slough House. There are too many of them to keep them straight – I wanted a table in the front of the book to help me keep track of who was who. And so, of course, once the story actually begins belatedly, it is difficult to care about any one character. 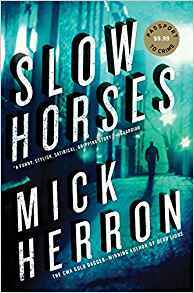 Later on Herron spends about 100 pages gathering all the Slow Horses from their various haunts one long night, as the mystery is about to be solved. BORING. Finally, the conclusions are unclear. You are left hanging – not hanging in a good sense; more like hanging because he seems to have forgotten to wrap things up with a number of characters. This is a Nancy Pearl recommendation. I am disappointed because I thought just maybe I had found another reviewer whose judgments were similar enough to me, that I could trust. Yes, I finished it. I can be a sucker for a mystery and I wanted to see how the mystery resolved itself. But you may want to read a Connelly or a Grisham or a George or a Christie or a Reich or a Le Carre.